Hints of a sales rebound coupled with its huge dividend yield have helped the toymaker outperform rival Hasbro in 2016. What: Toy and game retailer Mattel (NASDAQ:MAT) saw its stock jump 18% through the first half of the year, according to data provided by S&P Global Market Intelligence. Data through July 6. MAT data by YCharts. That performance is trouncing rival Hasbro (NASDAQ:HAS) over the past 52 weeks, yet long-term investors aren't nearly recovered from the all-time high that they witnessed of about $50 per share through much of 2013. So what: Mattel's two quarterly releases so far this year have painted a mixed picture of operating trends. Its holiday period marked an encouraging return to sales growth as the Barbie, Fischer-Price, and Hot Wheels brands met healthy demand. Cost cuts produced a sharp rise in profitability, as well. However, Mattel's Q1 was marked by plunging results from its girls segment that used to include sales from its licensing deal with Disney (NYSE:DIS) for the Disney Princess line of products. That exclusive arrangement has now shifted over to Hasbro, and the change left a gaping hole in Mattel's portfolio. The girls segment slumped by 36% in Q2, overwhelming growth in other categories to push sales down by 7% overall. Mattel's net loss expanded to $94 million from $73 million in the year-ago quarter. Now what: Mattel will post second-quarter results on July 20, and consensus estimates project a 1% sales decline and 11% higher earnings. That hardly seems to justify a valuation that's risen to 24 times earnings for a significant premium over Hasbro. Mattel's hefty dividend yield likely explains some of that valuation gap since it delivers an almost 5% yield compared to Hasbro's 2.5%. However, the retailer's recent earnings pace isn't strong enough to sustain that dividend since its payout ratio has spiked to well over 100% of profits. Cash flow provides better support, but the dividend payment can't continue at that level without an improving bottom line. 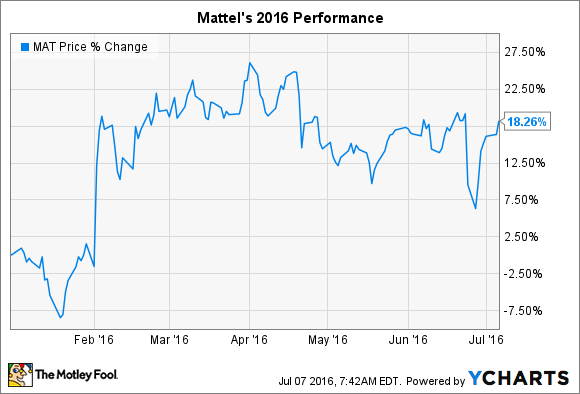 That's why better earnings will be critical for Mattel's stock to sustain its positive momentum.